This was a bloody battle that could have easily swung the other way if the dice were a little different. 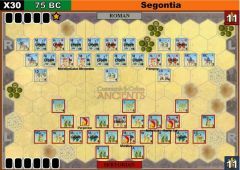 After moving the Elephants out of the way from easy attack, Antigonus attacked on the right causing some damage. Then after some skirmishing Selecus rushes in with his heavies on the right. But, that just left a window of opportunity for an elephant charge that decimated some of his best units. 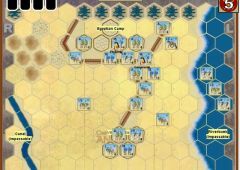 After more skirmishing, there was another charge and finally after one more attempt to take the center, the Seleucid army cracked under the pressure of massive losses. Thank you to my opponent BrentS. The dice just were not in your favor this time. But maybe next time! Dear all when I send messages to sharpe08 I keep on getting this message below does anybody have any idea if he has a newer mail. Can we please schedule our game. Would you be interested later today. I am at GMT+2, shall plan to play around 23:00 GMT which is 1 am my time. Can you please let me your available times. Greg vs. Togan and MarcG vs Brents. Since some of the newer posts are added to the table and these two were not, I felt like just reminding the moderator. Initial skirmishing wasn't very conclusive. Antigonids took a banner on their Left, but were exposed. 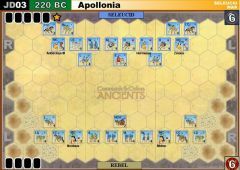 Elsewhere the Seleucid Light were pushing forwards, and with a hand that encouraged a strong push on my Right, I ordered my mounted units forward. Another easy banner, but exposed to riposte. 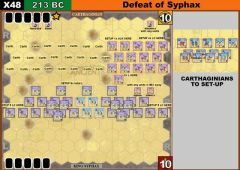 This happened immediately, and the score stood a 3-1 with my Heavy Cavalry with Demetrius surrounded by Heavy Cavalry and Chariots. 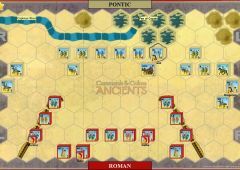 Out comes the First Strike, and just 1 hit, a banner and a leader check on Antiochus. He rolls LDR LDR, dies, the Heavy cav retreat, and despite the Heavy Chariot landing a good hit, Demetrius survives and eliminates the Chariots in battle back. That was the deciding roll of the match, with the Seleucid Left flank destroyed. Score stood a 5-1, then 6-1 after my reaction destroyed the HC. A victory of dumb luck. Last edit: 3 years 1 month ago by Mark-McG. The battle opened with skirmishes on both the left and right flanks while the Antigonids moved forward in the center. The Antigonids were driven back on their right flank and splintered but were able to reform their lines and hold their ground. 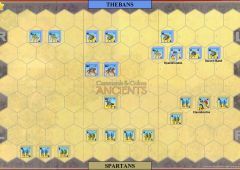 The Eumenes army then advanced on the Antigonids left flank but weren't able to completely shatter the flank due to a number of banner rolls that allowed the Antigonids to retreat. The Antigonids were then able to counterattack. During the counterattack Eumenes was cutoff and killed on a 1d roll. The battle then shifted back to the Eumenes left flank but the Antigonids were able to withstand the missile fire and and two one block units survived for the Antigonids until the end of the game. 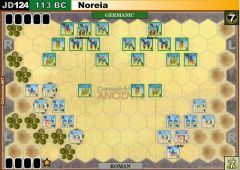 The battle ended with a reforming of the Eumenes lines in the middle followed by an advance in the center. The Antigonids were able to attack first and collect the last two banners to win the game but not before the Eumenes army killed a 4 block heavy unit on a battleback during the final turn. My draws were very interesting this game since as Antigonus I never drew a right card for the entire game. I ended the game with 4 left cards in hand. 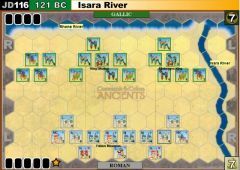 Tough battle for the Indians, with an initial charge in the center from an elephant and heavy chariot being repulsed and another heavy chariot eliminated soon after, it was uphill against some bad dice/good Seleucid) dice, with a leader kill ending the battle. Pretty even battle with the game coming down to really just the last few turns. 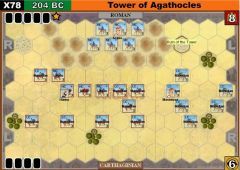 Toward the middle of the game Anitgonus army got fractured on their center and left flanks. The Indians advanced in the center and the Antigonids then attacked with a double time that got them with in one banner of the win. A counterattack then occurred which allowed the Indian army to turn the table and sweep through most of the center. After some additional skirmishing, the Antigonids elephant attacked a 1 block heavy unit (hopefully for the win) and missed on a 5d roll but were able to win that same turn when their HC scored 1 hit on a 4de roll. Gabriele played well on a side that seems challenging for this battle. 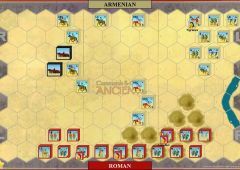 The battle started with the ındıan mounted units charging the seleucids center with the elephants and getting them ennoyed. Indians lost their EL but managed to get the phlanx interested. 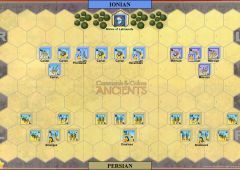 Then with mounted attecks and insisting fighting at the center the Indıans managed to break the phlanx and Selecus left the field. Upon breaking the center the cav. 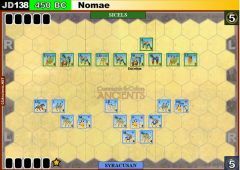 split into left and right flank and gave some ddamage to the elephants of the selecuds . Finally the med cav with the leader pushed the light bow to the last hex and managed to finish him . So with some very lucky dice rolls and a very unhappy I am the Spartacus roll for the sharpe08, the Indians managed to win the field. As this MT is coming close to an end., I would like to thank first the organiser and then all the participator of this great event. I had great time playing the scenarios and being a part of this MT series. It is really great to be able to play with a truly worldwide group of people. I hope that the next tournament will be annıuced by Mark asap. I am looking forward to participate in MT58 and the other to come. This tournaments are a great opportunity to keep this game interesting. Thanks a Lot for all the Efforts. Classic battle with a skirmish on the flanks and the two armies met in the center with a fierce shieldwall. Battle in the middle was bloody with pretty much a stalemate and the battle was even until the Antigonus cavaly and elephant cav charge on the left gained two banners a killed Seleucus for the 8th and final banner.